Humanitarian aid arriving by plane at Rinas Airport in Albania in the summer of 1999. Many organizations engaged in assisting refugees fleeing Kosovo. Humanitarian aid is material or logistical assistance (or aid) provided for humanitarian purposes, typically in response to an event or series of events which represents a critical threat to the health, safety, security, or wellbeing of a large number of people. These events may be natural—weather or health related such as floods, earthquakes, famines, epidemics—or man-made, such as armed conflicts. The primary objective of humanitarian aid is to save lives, alleviate suffering, and maintain human dignity. It may therefore be distinguished from development aid, which seeks to address the underlying socioeconomic factors which may have led to a crisis or emergency, while humanitarian aid is primarily used for emergency or disaster relief. Although humanitarian aid is well-intentioned, there have been unfortunate occasions in which the aid was inappropriate or abused, and in some cases even prolonged the suffering it was intended to alleviate. The development of standards for aid agencies is a recent effort to ensure that humanitarian aid does good, or, at least, does no harm. 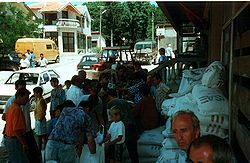 A distribution point for humanitarian aid in Southern Kosovo in 1999. In this case, food donated by USAID to an international NGO is being distributed by a local NGO to recipient families. Note the cans of cooking oil and sacks of flour being broken down into family sized rations by distribution point volunteers. The Swiss businessman Henri Dunant (1828 – 1910) was on a business trip to Italy when he witnessed the aftermath of the Battle of Solferino. Dunant arrived on Solferino on the evening of June 24, 1859, on the same day a battle between the two sides had occurred nearby. Thirty-eight thousand wounded, dying and dead, remained on the battlefield, and there appeared to be little attempt to provide care. Shocked, Dunant himself took the initiative to organize the civilian population, especially the women and girls, to provide assistance to the injured and sick soldiers. They lacked sufficient materials and supplies, and Dunant himself organized the purchase of needed materials and helped erect makeshift hospitals. He convinced the population to service the wounded without regard to their side in the conflict as per the slogan Tutti fratelli (All are brothers) coined by the women of nearby city Castiglione delle Stiviere. He also succeeded in gaining the release of Austrian doctors captured by the French. Dunant recorded his memories and experiences in the book A Memory of Solferino, published in 1862. Within the book, he described the battle, its costs, and the chaotic circumstances afterwards. He explicitly advocated the formation of national voluntary relief organizations to help nurse wounded soldiers in the case of war. This inspired the creation of the International Committee of the Red Cross (ICRC) in 1863. In addition, he called for the development of international treaties to guarantee the neutrality and protection of those wounded on the battlefield as well as medics and field hospitals. The 1864 Geneva Convention was based on Dunant's ideas. In 1901 he received the first Nobel Peace Prize for his work. 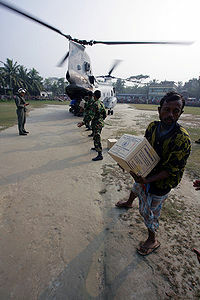 Today humanitarian aid is delivered by governmental agencies, non-governmental organizations, and other non-governmental humanitarian agencies according to humanitarian principles set out in Resolution 46/182 of the United Nations General Assembly (for governments and UN agencies), and in The Code of Conduct for the International Red Cross and Red Crescent Movement and NGOs in Disaster Relief (for NGHAs). Humanitarian aid organizations are funded by donations from individuals, corporations, governments and other organizations. 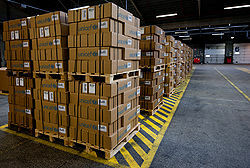 The funding and delivery of humanitarian aid is increasingly being organized at an international level to facilitate faster and more effective responses to major emergencies affecting large numbers of people. The United Nations Office for the Coordination of Humanitarian Affairs (OCHA) coordinates the international humanitarian response to a crisis or emergency pursuant to Resolution 46/182 of the United Nations General Assembly. Every organization participating in humanitarian aid operations has its own particular rules, regulations, and preventive plans of action for keeping their aid workers as safe as possible. Nevertheless, the dangers and threats inherent to these kind of operations have always existed and are not easy to minimize as each field of operation is unique. Even in areas with relative calm and tranquility, violence can suddenly appear. According to The Overseas Development Institute, a London-based research establishment, the most lethal year in the history of humanitarianism was 2008, in which 122 aid workers were murdered and 260 assaulted. Those countries deemed least safe were Somalia and Afghanistan. The legal basis for protection of humanitarian workers in conflicts is contained in the Geneva Conventions of 1949 and the related Protocol of 1977. These treaties describe the category of civilian non-combatant and outline the rights of obligations of non-combatants during conflict. These rights include the right to be treated humanely; to have access to food, water, shelter, medical treatment, and communications; to be free from violence to life and person, hostage taking, and humiliating or degrading treatment; and the prohibition against collective punishment or imprisonment. "Civilian non-combatants" include local citizens and nationals of countries that are not party to the conflict. However, the Geneva Conventions do not require that parties to the conflict guarantee the safety of humanitarian workers. The Conventions prohibit combatants from attacking non-combatants, and they require occupying forces to maintain general order. However, the Conventions do not require that combating parties provide security escorts, for example, when other factions threaten the safety of non-combatants operating in their area. While the Geneva Conventions provide protection for humanitarian workers, they do not guarantee access of humanitarian workers to affected areas: governments or occupying forces may, if they wish, ban a relief agency from working in their area. Médecins Sans Frontières was created in 1971 with the express purpose of ignoring this restriction, by providing assistance to populations affected by the Biafran civil war despite the prohibitions of the government of Nigeria. "Humanitarian access" is a specific legal term referring to the ability of neutral humanitarian actors (such as the United Nations, the ICRC, and foreign or local NGOs), to enter an area during a conflict in order to provide humanitarian aid as well as monitor and promote human rights. Whether due to restrictions posed by the government or by other parties to the conflict, or whether due to general insecurity, humanitarian access is limited in many areas and continues to worsen as the areas of limited or no access for humanitarians rise. For example, in 2007 humanitarian access was increasingly problematic in Darfur. Humanitarian aid workers belonging to UN organizations, PVOs / NGOs or the Red Cross / Red Crescent have traditionally enjoyed both international legal protection, and de facto immunity from attack by belligerent parties. However, attacks on humanitarian workers have occasionally occurred, and became more frequent in the 1990s and 2000s. This is attributed to a number of factors, including the increasing number of humanitarian workers deployed, the increasingly unstable environments in which they work, and the erosion of the perception of neutrality and independence. Wars between states became much less common in the period following the end of the Cold War. Unfortunately, these wars have been largely replaced by an increased incidence of internal conflict and resulting violence and miscommunication, increasing the risk to civilians and humanitarian workers alike. Between 1985 and 1998 slightly less than 50 percent of all humanitarian worker deaths came from workers in UN programs. 25 percent of these deaths were UN peacekeepers. Most deaths of aid workers are due to deliberate violence. One third of deaths occur in the first three months of deployment, with 17 percent occurring within the first 30 days. Despite good intentions, humanitarian aid workers have reported frustration and disillusionment with their efforts to alleviate human suffering. Aid organizations have been accused of serving their own interests above the needs of the victims of disasters, natural and man-made, and exploiting the situation as a way to validate their work and increase funding. Aid workers themselves have described how supplies intended for victims instead end up in the hands of those causing their suffering, while other efforts, such as refugee camps, may actually prolong the situation of the victims rather than alleviating it. In other situations the supplies proved inappropriate or sub-standard: Following the 2004 tsunami Indonesian victims were housed in dwellings that leaked, boats were found to be unseaworthy, and temporary homes were too hot for Indian victims to inhabit. During the past decade the humanitarian community has initiated a number of interagency initiatives to improve accountability, quality, and performance in humanitarian action. Four of the most widely known initiatives are the Active Learning Network for Accountability and Performance in Humanitarian Action (ALNAP), Humanitarian Accountability Partnership (HAP), People In Aid, and the Sphere Project. Representatives of these initiatives began meeting together on a regular basis in 2003 in order to share common issues and harmonise activities where possible. Working with its partners, disaster survivors and others, HAP-International produced the HAP 2007 Standard in Humanitarian Accountability and Quality Management. This certification scheme aims to provide assurance that certified agencies are managing the quality of their humanitarian actions in accordance with the HAP standard. In practical terms, a HAP certification (which is valid for three years) means providing external auditors with access to the organization’s mission statement, accounts, and control systems, providing for greater transparency in operations and overall accountability. that all possible steps should be taken to alleviate human suffering arising out of disaster or conflict. and that they help affected people recover from abuses. ↑ United Nations, A/RES/46/182 General Assembly 78th plenary meeting December 19, 1991. Retrieved November 30, 2012. ↑ Bruce Biber, The Code of Conduct: humanitarian principles in practice International Committee of the Red Cross, September 20, 2004. Retrieved November 23, 2012. ↑ David Lloyd Roberts, Staying alive: safety and security guidelines for humanitarian volunteers in conflict areas International Committee of the Red Cross, January 24, 2006. Retrieved November 30, 2012. ↑ Abby Stoddard, Adele Harmer, and Victoria DiDomenico, Providing aid in insecure environments: 2009 Update Humanitarian Policy Group, April 2009. Retrieved November 30, 2012. ↑ Jeffrey Gettelman, Chaos in Darfur Rises as Arabs Fight With Arabs The New York Times (September 3, 2007). Retrieved November 23, 2012. ↑ Mani Sheik, Maria Isabel Gutierrez, Paul Bolton, Paul Spiegel, Michel Thieren, and Gilbert Burnham, Deaths among humanitarian workers British Medical Journal 321(7254) (2000): 166–168. Retrieved November 30, 2012. ↑ Linda Polman, The Crisis Caravan: What's Wrong with Humanitarian Aid? (New York, NY: Metropolitan Books, 2011, ISBN 978-0312610586). ↑ Fiona Terry, Condemned to Repeat? : The Paradox of Humanitarian Action (Cornell University Press, 2002, ISBN 978-0801487965). ↑ 9.0 9.1 Humanitarian aid: Weighed and found wanting The Economist (May 24, 2007). Retrieved December 3, 2012. ↑ People in Aid, Background to the People In Aid Code of Good Practice Quality Standards Field Guide – First Edition, December 2009. Retrieved November 30, 2012. ↑ Humanitarian Accountability Partnership 2007 Capacity.org. Retrieved November 30, 2012. ↑ Ruth Gidley, Can a certificate make aid agencies better listeners? AlertNet (June 6, 2008). Retrieved November 30, 2012. ↑ The HAP 2007 Standard Humanitarian Accountability Partnership (HAP). Retrieved November 30, 2012. ↑ Humanitarian Charter and Minimum Standards in Humanitarian Response The Sphere Project. Retrieved November 30, 2012. Roberts, David Lloyd. Staying Alive. International Committee of the Red Cross, 1999. Available online Retrieved May 6, 2008. This page was last modified on 19 January 2018, at 19:44.